Like any PT program the road marching took a while to get into. Just completed my fourth march. There are few things I appreciate more than silence so I don’t wear head phones when I ruck. That and a solid hour of not hearing “Honey” or “Dad” gives a man some time to think. So here are some thought, lessons and considerations. Outside of mindset there are three things you need to be combat effective, and they are conditioning, training, and tools. I am defining combat as any emergency where your inability to respond to a threat may cost you your life. At this point in my life I am heavy on the training and tools, light on the conditioning. In my experience I believe most to be heavy on tools. The person who thinks they are in shape might be running marathons but may have never carried a pack or rifle over distance. The person who thinks they are trained might have spent lots of time on the square range or dojo but never been punched in the face. Mental, physical and spiritual conditioning have need to be your foundation. You cannot buy these things or get them from anyone else. You must earn them with blood, sweat, and tears. As the tides are turning in our country, men of honor and courage must remember the Minuteman and his readiness to respond to whatever the threat might be. Consider the 3/30/60 MCS Challenge, that is 3 miles, carrying 30 lbs., in 60 minutes. The great thing about this Challenge is that if you smoke it you can tweak any of the numbers and Challenge yourself. But here is the catch, you need to do it with the bag you carry every day, what do you mean you don’t carry a Bag of Evil. You may quickly find out that the messenger bag you carry to and from work/school every day gets uncomfortable after a mile or so. If you cannot drop what you are doing right now and do 3/30/60 on the road during the day, you are not going to be able to do 2/20/30 with a rifle in the woods at night. Bag- as I mentioned in the first article, I started back to road marching after I got my Mystery Ranch 3 Day Assault Pack. I hate to be a fan boy but I am in love with this pack. 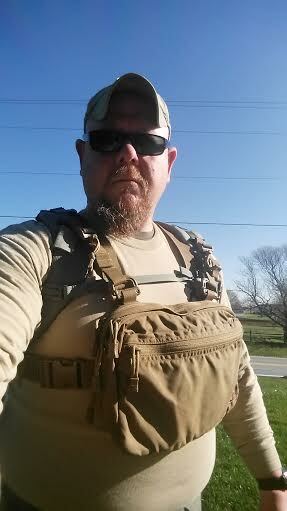 Being 6’2, 300 lbs with a 52 inch chest, I have found it hard to find packs that fit me. In my first four marches I have had zero neck/back/shoulder pain. You will need a pack with a frame and hip belt. The choice is yours. Just make sure that you are able to secure what you are carrying so it moves with your body and not independently. You will know pretty quick if your pack is good for carrying weight over distance or just looks cool. Weight- using the scale we use for shipping product showed the weight of my BOE including two 27 ounce water bottles to be around 17 lbs. This leaves my pack about 75% empty. The challenge is 30 pounds. So how do you add weight? If you look at the GORUCK site they sell weights to put in your pack. There is no way I am carrying useless weight. In a real life emergency you are going to need space in your pack to carry food, water, ammo, and first aid supplies that you pick up in addition to your EDC. That is why I recommend you carry water. There are two easy ways to do this to get your weight right. The first is one or more hydration bladders . Just remember that every liter is 2.22 lbs. The other is 32 ounce Gatorade bottles at 2 lbs. apiece. So a two liter bladder and 3 bottles would give you 10.4 lbs. You don’t need to be a Nazi about the weight, just get close. The great thing about it is that you can drink it or spill it out if it gets too heavy. Can’t do that with a weight. Clothing- I was wearing kilts before they were all the rage. I prefer Amerikilt. What I like most about the kilt is the freedom of movement. Remember if you wear underwear it is a skirt. Believe it or not your giblets stay pretty warm since there is no wind blowing between your legs. Having thunder thighs I rub the inside of my thighs with deodorant to prevent chaffing. If you do get chaffed put some Witch Hazel on them. It burns like hell for a few seconds but then soothes. Dress for the outdoors like you would any other time. Base/wicking layer, insulation layer, and wind/waterproof layer. This is an anaerobic activity and your body will be pumping like a furnace. If it is not windy or raining, ditch the top layer. It is very easy to overheat and you need to learn to vent to stay between sweating and being cold. Today here is was about 45 degrees when I was out. I wore a short sleeve Under Armor t-shirt under a long sleeve cotton t-shirt. You need to have something to soak up the sweat that the wicking layer draws away from your body that is what the insulation layer is for as well as keeping warm air in its fibers and around your body. If I am over heating on a climb, the first thing I do is take off my hat. When the climb is over I can put it back on. Shoes- all my outdoor shoes are Merrell . I recommend Alpaca socks , they are warmer than wool because they have hollow fibers, and unlike wool they are naturally antibacterial so they don’t stink. They are pricey so start with just one pair if you need to. MapMyHike app sponsored by Under Armor- right now I am using the free version but may actually splurge and get the paid for $30 year. This app has been a huge help in keeping track of marches and my progress. Losing weight- because this is an anaerobic exercise you will lose weight. I am burning three times the calories rucking than I was using a treadmill. The terrain and weight keep you burning fat and not sugar. My plan is to ruck three times a week. If you accept the 3/30/60 challenge get out there and do it, e-mail me and let me know how it goes. You can also post on our Facebook page #MCSchallenge.